Spheniscus mendiculus is a penguin exclusively native to the Galápagos Islands. It is the only penguin to live on the equator and can survive due to the cool temperatures resulting from the Humboldt Current and cool waters from great depths brought up by the Cromwell Current. Nearest relatives are the African Penguin, the Magellanic Penguin and the Humboldt Penguin. The Galápagos Penguin is primarily found on Fernandina Island and the west coast of Isabela Island, but small populations are scattered on other islands in the Galápagos archipelago. 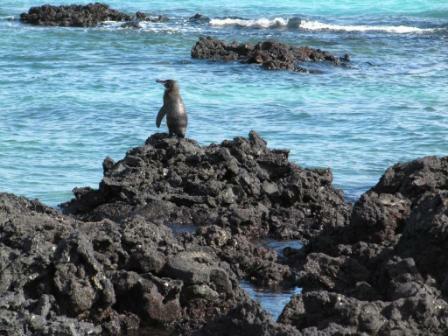 Habit: The Galapagos Penguin is one of the smallest penguins. It is the only penguin to cross the Northern Hemisphere which means they live farther north than any other warm weather penguin. 90% of the Galapagos Penguins live among the western islands of Fernandina and Isabela, but they can also be seen on Santiago, Bartolome, northern Santa Cruz, and Floreana. The average size for the penguins is 19-20 in and 5.5 lbs. They have a black head with a white border running from behind the eye, around the black ear-coverts and chin, to join on the throat. They have blackish-grey upperparts and whitish underparts, with two black bands across the breast, the lower band extending down the flanks to the thigh. . The female penguins are smaller than the males, but they are still a lot alike. They eat small schooling fish, mainly mullet, sardines, and sometimes crustaceans. They only go search for food during the day and normally within a few kilometers of their breeding site. They depend on the cold nutrient-rich currents to bring them food. 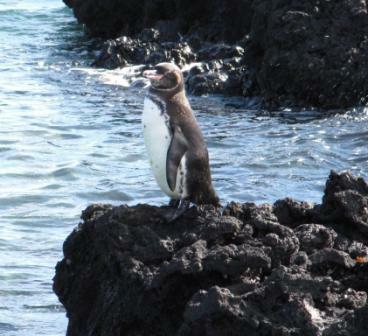 Behavior: The Galapagos Penguins breed as many as three times a year, since they don’t have a specified breeding season. Because of this, they are able to choose when to breed, and they ultimately decide this depending on food supplies. Before they breed, the penguins molt, and they may do this twice a year. While the birds are molting, they usually stay out of the water. They are able to go to the sea for food rather than starve though since the water is so warm in their area. Since they molt right before breeding, they are sure that they will not starve during the molting process, that may mean that there is not enough food during the breeding season, but the survival of the adult penguins is more important than the younger ones since they are the ones that make sure the species does not go extinct.